Ah, this is the TV news Josie's Juice has been waiting for! Sylvia Jeffreys and Peter Stefanovic are engaged! And... it happened a few weeks ago, but they only announced it this morning. Sylvia is the 'Today' newsreader and Peter is a fellow journalist and co-host on 'Weekend Today', and have been together for over two years. "Asked my missus to be my wife and she said yes," Peter, who is the younger brother of Today show host Karl, said on Instagram. "A couple of weeks ago Pete popped the question, and I said yes, OF COURSE!!!" Jeffreys wrote. "We've had the most wonderful time celebrating with great mates. We couldn't be happier." 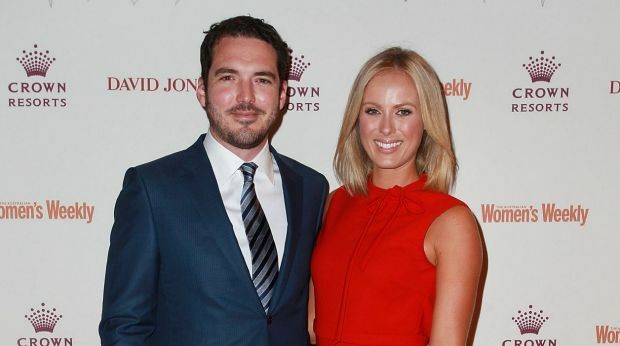 The development of their relationship has been lovely to watch; they started dating in early 2014, when Peter was Channel Nine's Europe correspondent. They confirmed their relationship in June 2014, after months of speculation. The pair kept in touch when they worked together on the Today show over the 2013 Christmas break. (I recall seeing them together on set, on my telly, and thinking: they'd make a cute couple). Peter, 33, has been back in Australia from his foreign correspondent assignment since 2015; in an interview with Fairfax Media, Sylvia firmly ruled out the possibility of the couple taking on a permanent joint hosting gig in the future. Speaking to Fairfax Media in November last year, Sylvia said that sharing a desk again with Peter would be "too difficult". "We had a good time before we were together, but I'm not really sure if it's a good idea now."